The innovative design features of the Sanlorenzo SL86 have captured the imagination of superyacht buyers with ten models sold worldwide since its public debut in January 2015, including hull number one Adriatic. The first striking feature that you will notice upon stepping aboard is the central staircase, which is suspended between two panes of glass to give the impression that the steps are floating in mid air. This clever design flourish is just one example of the impressive interior styling created in conjunction with Officina Italiana Design. The innovative design features of the Sanlorenzo SL86 have captured the imagination of superyacht buyers with ten models sold worldwide since its public debut in January 2015, including hull number one Adriatic. The first striking feature that you will notice upon stepping aboard is the central staircase, which is suspended between two panes of glass to give the impression that the steps are floating in mid air. This clever design flourish is just one example of the impressive interior styling created in conjunction with Officina Italiana Design. As you would expect from a Sanlorenzo yacht, the interiors are brightly illuminated by extensive saloon glazing, but this effect is amplified by the swooping sheerline, which dips down around the saloon area to follow the outline of the enormous windows. As well as being practical, this exterior design feature also fits seamlessly into the sleek lines of this fast planing yacht — an effect that is best admired from the palatial saloon area. As you would expect from a Sanlorenzo yacht, the interiors are brightly illuminated by extensive saloon glazing, but this effect is amplified by the swooping sheerline, which dips down around the saloon area to follow the outline of the enormous windows. As well as being practical, this exterior design feature also fits seamlessly into the sleek lines of this fast planing yacht — an effect that is best admired from the palatial saloon area. 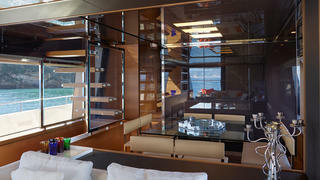 Shaded exterior spaces are a key theme on board the Sanlorenzo SL86. Foremost among these is the foredeck seating area with its C-shaped wrap of seating, which can be shaded from the elements when at anchor. Four stainless steel pillars support this cabana-style bimini, creating a private relaxation area with uninterrupted views. 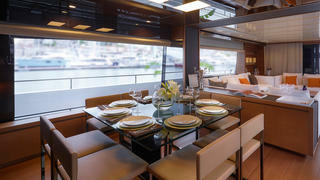 Shaded exterior spaces are a key theme on board the Sanlorenzo SL86. Foremost among these is the foredeck seating area with its C-shaped wrap of seating, which can be shaded from the elements when at anchor. Four stainless steel pillars support this cabana-style bimini, creating a private relaxation area with uninterrupted views. 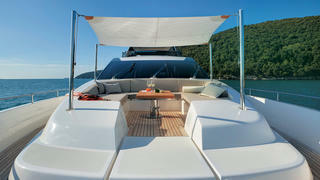 Much like the foredeck, the flybridge on the Sanlorenzo SL86 is another flexible exterior space. A central dining table can seat eight in comfort just aft of the upper helm station, but the most eye-catching feature is the hardtop. Created by Opacmare, this light, elegant hardtop functions like a blind, with slats that can be either angled diagonally to let light in or fold horizontally to shut out the sun. 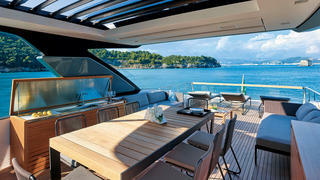 Much like the foredeck, the flybridge on the Sanlorenzo SL86 is another flexible exterior space. A central dining table can seat eight in comfort just aft of the upper helm station, but the most eye-catching feature is the hardtop. Created by Opacmare, this light, elegant hardtop functions like a blind, with slats that can be either angled diagonally to let light in or fold horizontally to shut out the sun. In order to create the maximum amount of upper deck space, the flybridge on the Sanlorenzo SL86 stretches back over the transom of the yacht, creating a further nine square metres of open space. This can be used to fit either three sunloungers or a Jacuzzi. This also has the added benefit of sheltering the entire cockpit below, while a roll-out bimini ensures that the sunloungers can be covered when required. In order to create the maximum amount of upper deck space, the flybridge on the Sanlorenzo SL86 stretches back over the transom of the yacht, creating a further nine square metres of open space. This can be used to fit either three sunloungers or a Jacuzzi. 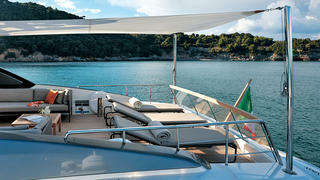 This also has the added benefit of sheltering the entire cockpit below, while a roll-out bimini ensures that the sunloungers can be covered when required. All of these design features come together to create an elegant profile. As the yard puts it: "In a glance at the style and the general look, you can easily find out the Italian designers’ skilled hands, but moreover you immediately recognise a Sanlorenzo." And that striking exterior profile reflects the SL86's impressive performance. 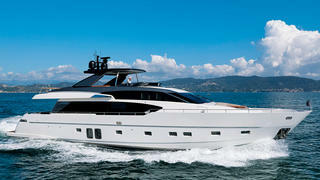 Powered by a pair of 1,947hp MTU 12V2000 M94 engines, this fast planing yacht is capable of a top speed of 32 knots. All of these design features come together to create an elegant profile. As the yard puts it: "In a glance at the style and the general look, you can easily find out the Italian designers’ skilled hands, but moreover you immediately recognise a Sanlorenzo." And that striking exterior profile reflects the SL86's impressive performance. Powered by a pair of 1,947hp MTU 12V2000 M94 engines, this fast planing yacht is capable of a top speed of 32 knots.